Fewer things are as hidden as my family’s silent competition for the best Beef Tamales. We weren’t blindfolded, but we would be seated at the table. Then served a plate full of tamales and a fork. The first bite was taken, and the cook would anxiously await for the obligatory, “These are the BEST tamales ever!” They would smile and sheepishly look away. 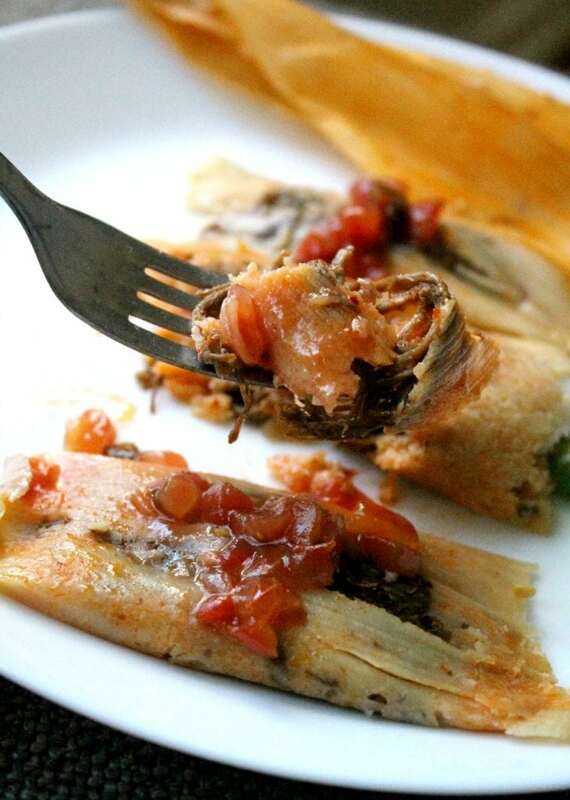 The next day, while at another relative’s house, we would proclaim them to make the best tamales. And on and on it went until the Holidays were over. Sorry abuelita. Sorry mom. Sorry tías. I’m jumping in the ring, and proudly sharing with you the best beef tamales ever. Beef tamales are amazingly delicious. Meaty and with just the right amount of spicy flavors. They are a classic Mexican food that will be a favorite until the end of time. 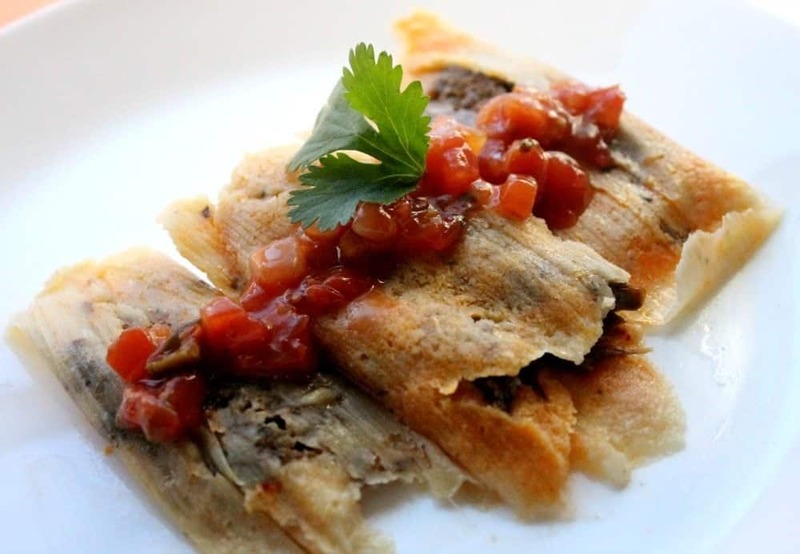 This Beef Tamales recipe is the way we make them in Durango, Mexico where my father and the majority of our family still lives. 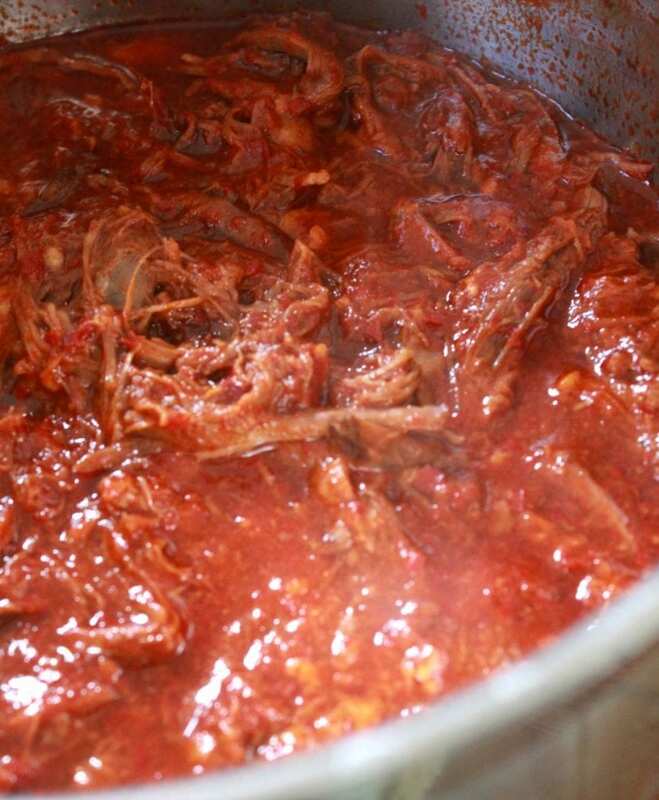 Reserve 2 cups of beef broth from the cooked roast to make the red chile sauce. Some people toast the chiles. We soak the guajillo chiles in warm water for 30 minutes. Blend them with garlic, cumin, salt and pepper, and the reserved beef broth. It will be the consistency of a thin paste. Taste it for salt. Heat the oil in a large pot. I use the same pot that I cooked the roast in. Add the red chile sauce and stir for 4-5 minutes. Then add the shredded beef. Let it all simmer together for about 30 minutes or until heated through. Set aside. Note: While you’re waiting for the beef to finish, soak the corn husks. 1. Smear a damp corn husk with prepared masa. 2. Add beef filling in the center of the corn husk and in the center of the masa. 3. Fold each side inward. 4. Then fold the corner top over. 5. Set each tamale into a large stock pot. 6. Steam for 1 ½ hour. If the masa pulls away from the corn husks easily, they are done. If not, add more water to the pot and continue steaming. Beef tamales are amazingly delicious. Meaty and with just the right about of spicy flavors. They are a classic Mexican food that will be a favorite until the end of time. Heat 2 tablespoons oil in a large stock pot. Salt and pepper all sides of the beef roast. Brown each of the sides of the roast. Add the beef broth, 3 garlic cloves, onion, and bay leaf. Remove from pot and let the meat rest. Reserve 2 cups of the beef broth. Discard the rest. In the meantime, remove stems and as many seeds as possible from the guajillo chiles. 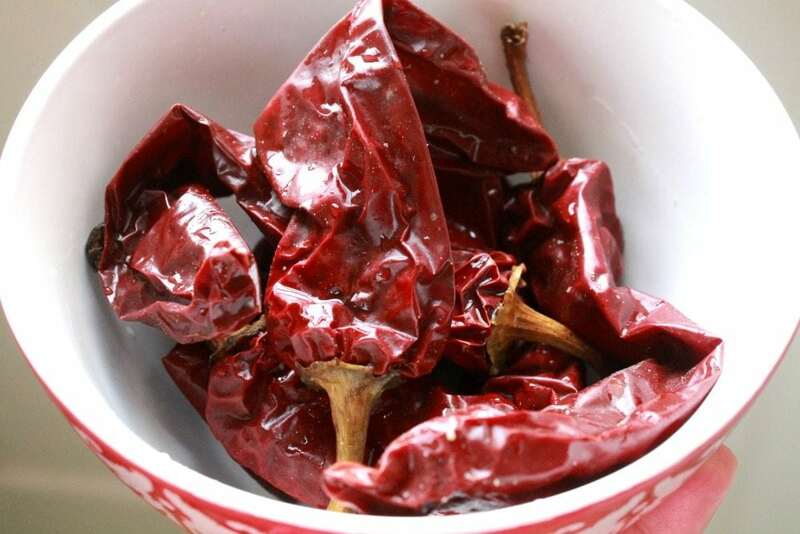 Soak guajillo chiles in warm water for 30 minutes or until pliable. In a blender, add soaked guajillo chiles, 1 garlic clove, cumin, salt, pepper, and reserved beef broth. Blend into a thick red chile sauce. In a large pot, heat 2 tablespoon oil. Add the red chile sauce and cook on low heat for 4-5 minutes. Stir occasionally. While you’re waiting, shred the beef. Add beef to the red chili sauce. Heat thoroughly. About 30 minutes. Soak the corn husks for at least 30 minutes in hot water. With a knife or a spoon, spread a thin layer of the masa on the corn husk. In the center of the corn husk and in the center of the masa, add the filling. Fold the corner top in. 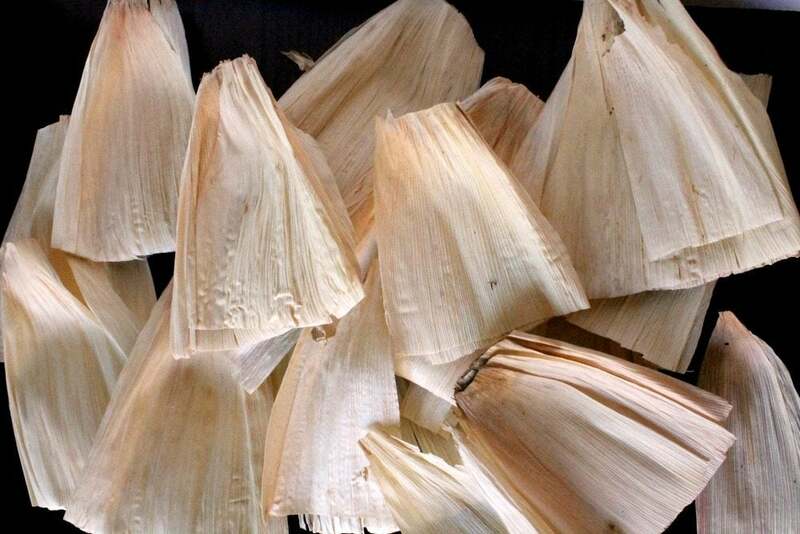 Place a few of the corn husks on the bottom of the pot, then add the uncooked tamales. Add 2 cups hot water. Note: If you don’t have a steamer, adding the kitchen towel will help them steam better. Oh, My gosh These look so darn good! My son would absolutely love them, this was one of his favorites when he was a kid. Tamales always seem so intimidating to me! Lol, but I may have to try my hand at them anyway because these look amazing! They’re not hard to make. Just time consuming. Once you try it, you’ll see what I mean. Hope you enjoy! Oh my gosh, I’m so glad I came across this post, because my husband is OBSESSED with tamales, and I’ve been trying to decide if I should make them myself. Thanks for sharing this recipe! Oh, I LOVE tamales and I love making them. However, it takes quite a while, but it is so worth it. Yours look amazing! Ha! Love it! Family competition!! Can’t wait to try the recipe. yum! I am going to attempt these during our Christmas break – looks so delicious! The older I get the more I love Tamales and wish that I could get them year round! Our family is getting together this Friday to make some. Yours turned out so good. Thanks for sharing.